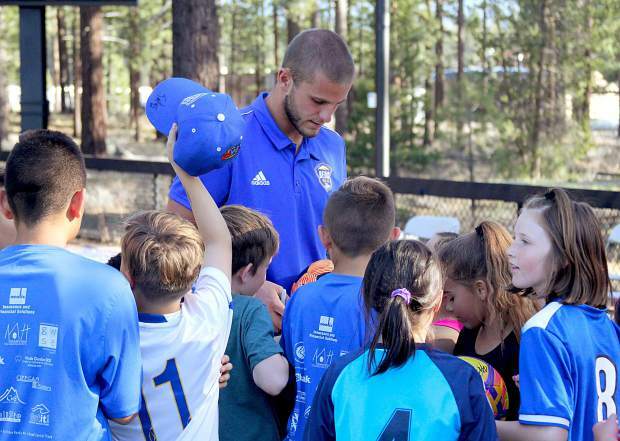 A Reno 1868 FC player signs autogrpahs for kids. 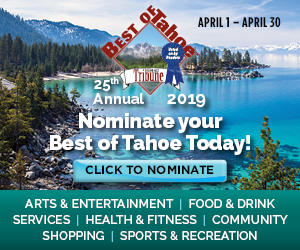 Lake Tahoe Community College men's team captain Jorge Medina (11) looks to pass Tuesday, April 24, agaisnt Reno 1868. 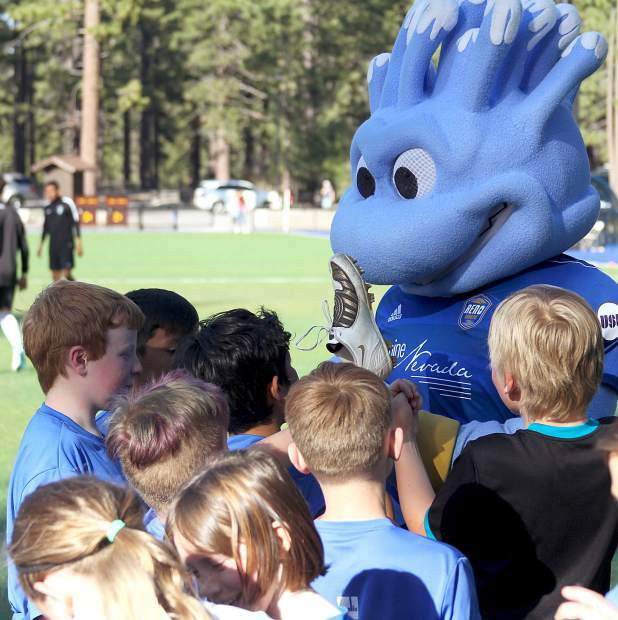 Reno 1868 Football Club's mascot Truckee entrained kids and signed autographs Tuesday, April 24, after a soccer clinic hosted by the professional team. 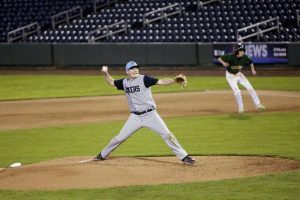 Lake Tahoe Community College played an exhibition Tuesday, April 24, against Reno 1868. 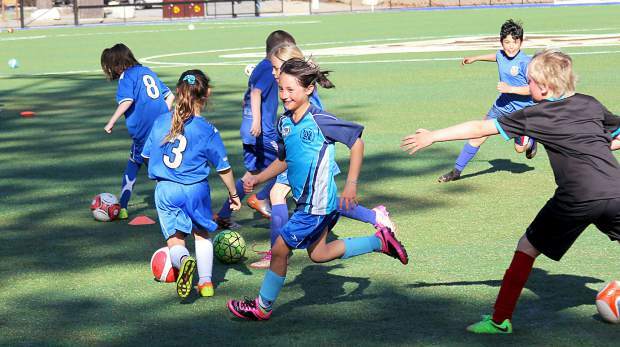 Kids try to avoid being turned into zombies during a Reno 1868 youth soccer clinic at Lake Tahoe Community College. A camper fires a shot on goal after dribbling through plastic cones. A camper takes a shot on goal. A group of campers meet at one of the five stations and get direction from a Reno 1868 player. 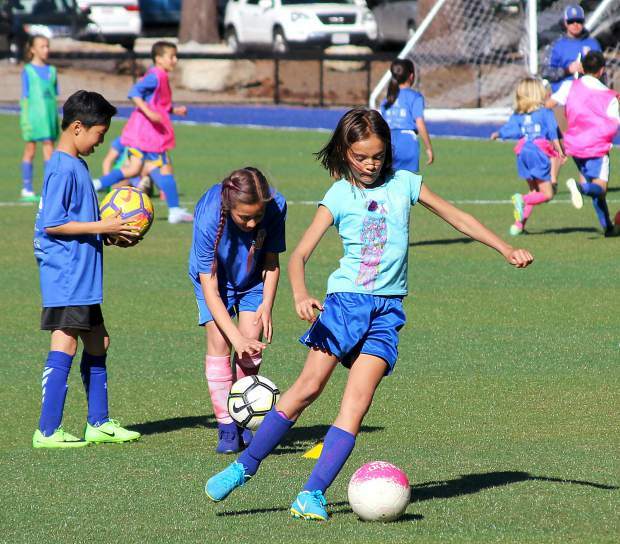 Kids were trained and all were entertained Tuesday, April 24, with the Reno 1868 Football Club’s visit to Lake Tahoe Community College. 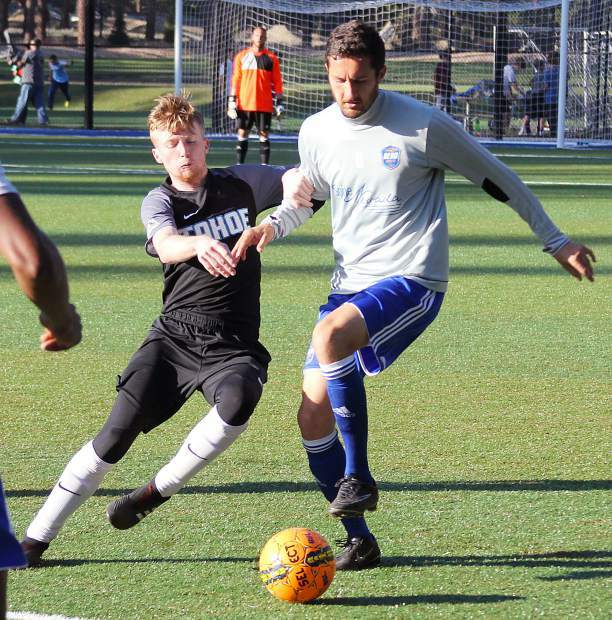 The professional soccer team practiced at the college’s stadium field under the sun in the afternoon, hosted a 90-minute camp for kids in the early evening and finished with an exhibition match against the Coyotes in front of hundreds of spectators. 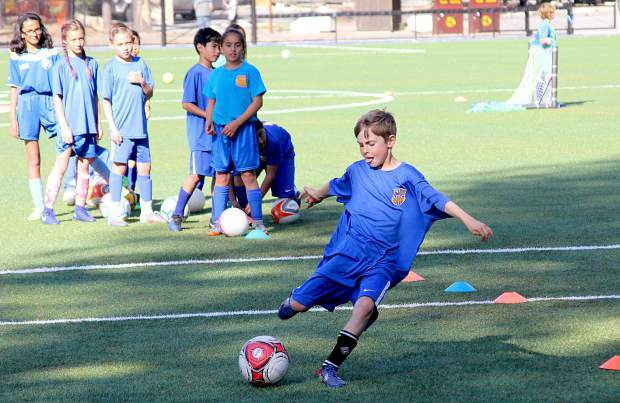 About 75 kids, ages 8 to 12, from the South Tahoe Futbol Club (STFC) took part in the clinic. The kids were separated into groups and rotated stations. Kids scrimmaged on a small part of the field with tiny nets. They were put through ball-handling drills, traveling in and around cones, before firing shots on goal. And they played a game where they were chased and turned into zombies. Following the clinic, kids mobbed the five or six Reno 1868 players and coaches who put on the clinic for autographs. For 30 minutes the players signed everything from cleats to hats to shirts to water bottles. Reno 1868’s purple, fuzzy mascot, Truckee, also got into the act. He signed autographs and entertained kids, or, was tortured by the kids — sometimes it was hard to tell with the kids so demanding of his attention. After training and entertaining the children, Reno 1868 got back on the field in uniform and gave the college kids some education in front of a standing room only crowd. The Coyotes kept pace with the pros for most of the first half but Reno 1868 showed its skill and systematically broke down the amateurs. Jeremy Evans, the Coyotes women’s head coach, had a signing event for his players who graduated and are moving on to four-year colleges. He coordinated it to go along with the festivities. Rebecca Niblett will attend the University of Bridgeport, a division II school in Connecticut. Caitlyn Bidart is headed to division II Northwestern State Oklahoma State University. 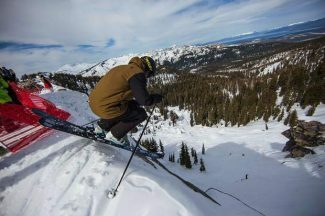 South Lake Tahoe’s Kenya Maltase chose division II California State University, East Bay. And Megan Masters is headed east, to division III Framingham State University in Massachusetts. 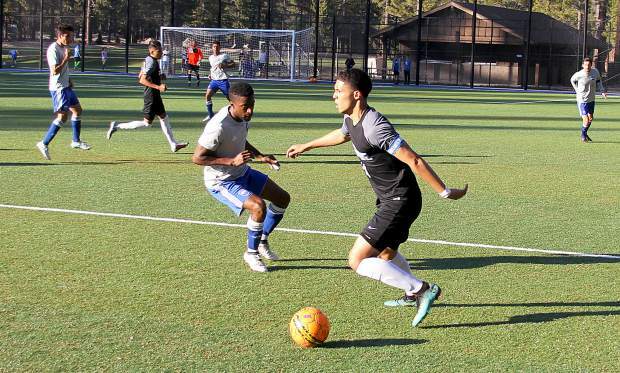 With the latest four college signings, LTCC has transferred 65 percent of its sophomores since the program’s inception in 2014, putting it among the top of all junior colleges in California. 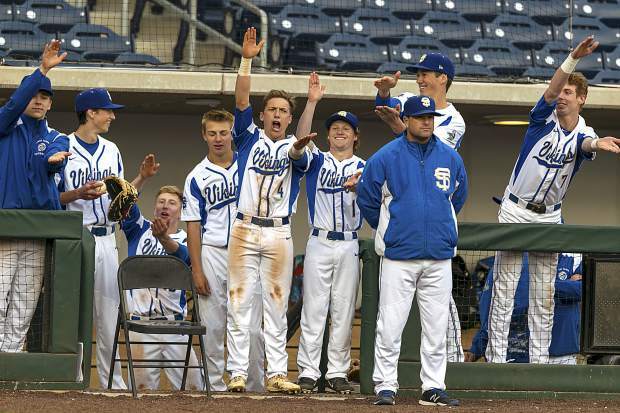 “Over 90 percent of our players have received four-year athletic scholarship offers,” Evans said. Evans and Arbelaez, who are best friends, hung out with Reno 1868 head coach Ian Russell following the match and chatted about future games and events they can do together.